Is Your Antique Fireplace Good To Restore? Before the permanent shift in energy use and the way homes were heated, the fireplace was the key component in most rooms. Some historical homes have many different fireplaces, and even though they might be beautiful, many are no longer functional. For those who love the idea of restoring an antique fireplace the center of the room once more, they are faced with many logistical roadblocks. Has the fireplace been renovated before? It is safe for burning wood? Would a gas insert be a better option? Can the fireplace itself be restored? Our friendly and experienced team are happy to answer all of your queries over the telephone on 0116 251 9592. Here’s what you need to know about fireplace restoration and use in old historical homes. Not all fireplaces in older homes were made to burn wood. 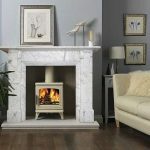 Sometimes new developments in fuel sources meant the previous homeowners had to change the fireplaces to be connected to the first central heating systems or that the space for burning logs was changed to hold a space for a coal stove. 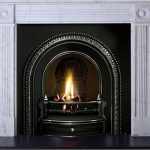 If you truly want to restore the fireplace to be wood burning once more, it’s important to know if the space was ever retrofitted previously. The soot from burning coal may coat stone or brick and weaken it, so a few decades of coal burning in the past might mean an old chimney will need some additional TLC. For fireplaces that had at one point been connected to antique central air systems, there might be holes in the brick or old pipes running through the chimney that will need to be removed. These holes can sometimes be plastered over, so it’s important to carefully strip the chimney and fireplace down to bricks to assess its condition. After you’ve successfully gutted and prepped the old fireplace, it’s time to make repairs and get it ready for actively burning again. If you want to burn wood again, consider a wood burning insert with doors to go in the fireplace opening. These are much more energy efficient than open wood fires that actually draw heat from the room, and they still provide the ambiance of a fire with glass doors. 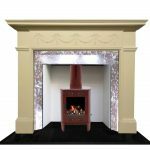 You can also buy Victorian fireplace inserts that keep the original style of the fireplace. Not all fireplaces in old houses were open flame. Many had cast iron faces with decorative plates that were much more effective at heating the home. These stove styles are still available today, with modern updates to improve effectiveness even more. Gas fireplace inserts are also a popular choice as they are low maintenance; there is no ashtray to clear or doors to clean. If you really want the old, open-fire look (no doors in the way), you might also consider gas logs. These logs can be remote controlled so you don’t need to light them, and they produce realistically cheery flames. The type of burning or fuel you hope to use will inform the type or extent of repairs you need to make. For older brick chimneys, you may need to repoint crumbling mortar and get the chimney lined and insulated before it is safe to burn wood or any other fuel. Without fixing structurally compromised brick, you risk the safety of your home. Lining and insulating are essential because they provide a heat barrier and a heat-resistant surface to reduce the dangerous buildup of creosote and other harmful burning byproducts. Chimneys are easier to clean and maintain if they are lined. Older chimneys may be unlined or they may be lined with clay tiles and smooth mortar. Usually, these tiles are cracked with age and the mortar is no longer effective. Without the liner, the brick and mortar of old chimneys gets weaker with each fire, simply because of the intense heat and corrosive creosote. New liners are made with new clay tiles (the most traditional option), cast-in-place concrete (just as effective as tiles, but less costly to install), or inserted metal liners (common with gas and alternative fuel inserts). The type of flue liner you need depends on the state and shape of your old chimney. It’s much easier to install gas inserts in a fireplace space because these simply need to be vented with a metal flu liner instead of a fully restored chimney, which can be less costly. Be sure the insert is installed properly so that you don’t experience drafts from the outdoor venting when the fireplace is not running. After restoration and installation, you should make sure that you run several safety tests. Ask your fireplace professional to check for flue leaks and heat loss. You’ll also want to measure emissions in the room to make sure you’re not at risk for carbon monoxide poisoning or smoke inhalation. To keep a newly restored fireplace in good shape, you should be committed to cleaning. Wood burning fireplaces need the most attention, since creosote can build up quickly, especially if your fire is not burning hot and your wood fuel is not as dry or clean. Have your fireplace inspected and checked for safety annually. For more information, contact us on 0116 251 9592.